Moetapu Rd , Okahoka point. a 7.2 metre boat and a floating jetty. 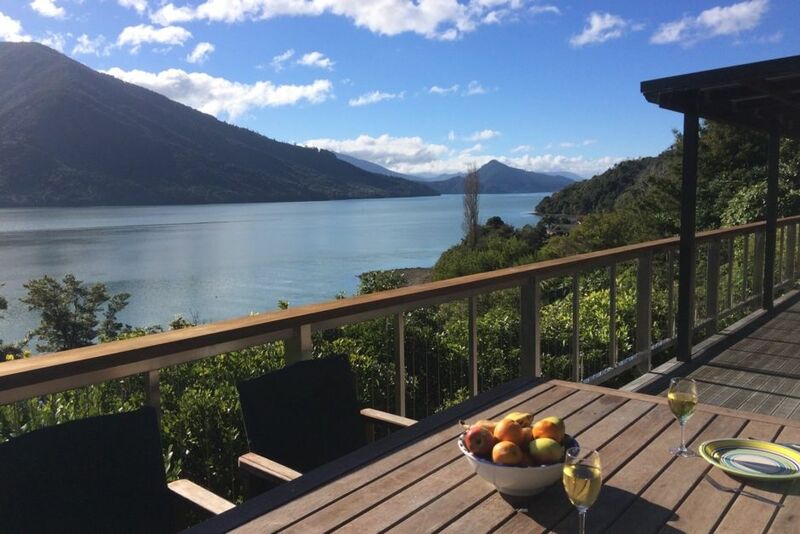 A large outdoor deck that allows for outdoor entertaining and stunning view of the sounds. There is off road parking for cars and a boat trailer across the top of one of two entrances to the property. The upstairs games rooms contains a table tennis table and foozeball table. Dinghy, oars, kayaks, lifejackets, bikes and helmets are available. Second time we have stayed at this location, and as before it was fantastic. Every facility required is available at the house. Its an extremely pleasant location and ideal for a quiet retreat. Perfect holiday house for our little getaway. Loved the pier and the spa pool. Great extras. The large house was spacious and lovely. All three bedrooms we used were filled with light and gorgeous views. In fact, the views out to the bay and the surrounding mountains are rather mesmerizing. You might not want to leave. It is a fairly long and winding road up to the house but you seldom encounter another vehicle along the way. You can take walks and there is access to a hiking trail right across the road. We would come back here in a heartbeat. Spacious house with amazing views. We would have appreciated some warning re the driveway. Very steep. Not possible for our 12 seater van to access. Thanks for that feedback ,we hadn't realized that a 12 seater van would be incoming- a first for us ! but we will certainly mention in our info to others. Fantastic. Amazing area and an amazing home.